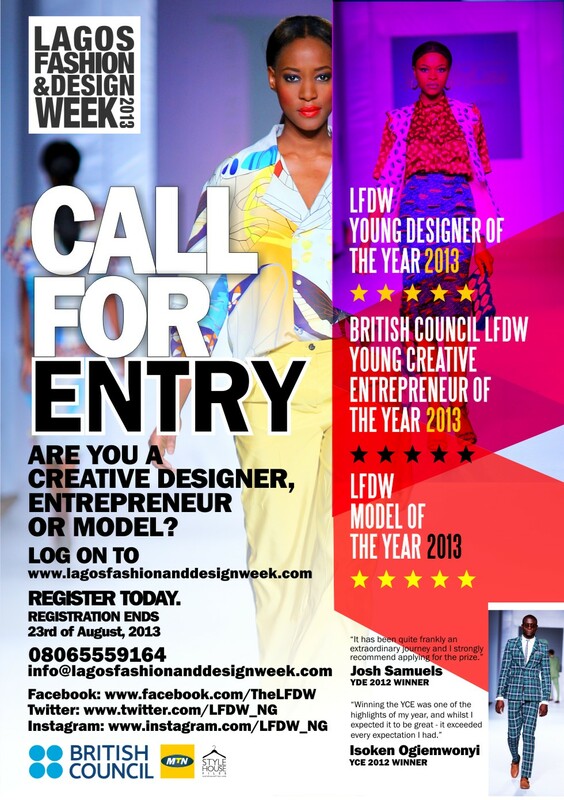 Lagos Fashion and Design Week (LFDW) is now accepting applications for the Young Creative Entrepreneur (YCE) & Young Designer (YD) of the year awards 2013. The YCE awards programme is unique in that it rewards the talent and initiative of young creative entrepreneurs from across the creative fashion industry recognizing the central role they play in the development of a competitive and sustainable creative economy. One of the key objectives of the YCE programme is to sensitise the UK creative sector to the opportunities that come from working with other creative entrepreneurs in emerging economies. A second objective is to better understand the dynamics of being an entrepreneur in the creative economy. With the young designer of the year award, LFDW offers young fashion designers the opportunity to be participants at targeted seminars and workshops facilitated by British Council and a chance to exhibit their collection in front of a select audience at Lagos Fashion and Design Week. At LFDW, its aim is to promote and nurture the talents of today’s young, creative innovators, so that tomorrow’s creative industries can continue to play a major role in the economy of Nigeria and the rest of the world; and to provide young talents with a platform for their ideas and designs. Nigerian fashion has metamorphosed from being merely cultural to a way of life. A whole new generation of fashion designers, music artistes, fashion creatives and fashion’s taste makers have made it desirable to be seen wearing clothes made by Nigerian designers. This influence has gradually seeped out and is being represented on runways around the world. Young creative entrepreneurs AND designers in the arts and fashion industry are eligible for this award. British Council and LFDW have identified the need to identify such young creative talents and provide them with the right networking abilities to further expose their business to the much needed prominence and simultaneously grow the Nigerian fashion industry. The winner of the Fashion award will be invited to take part in a tour of the industry in the UK during London Fashion Week. We anticipate that this tour will take place in 2014. LFDW normally chooses between 10 – 12 young designers who are trained in Master Classes by British Council for a week to enhance their design skills towards their competition during Lagos Fashion & Design Week, where one designer will be crowned the winner. The screening sessions for the awards will kick off in Port Harcourt on the 26th of August, Abuja on the 28th of August and ends in Lagos on the 30th of August. Lagos Fashion and Design Week is a multi day fashion event platform which aims to drive the Nigerian fashion economy and lift its profile within the industry by bringing together buyers, consumers and the media to view the current collections of designers in the fashion capital of Lagos, Nigeria. Beyond the event, Lagos Fashion and Design Week is a platform that has since 2011, succeeded in repositioning fashion as a useful tool for commerce and creativity in Nigeria.